For Tim Wu an attention merchant is a firm that seeks to capture and maintain the attention of an audience and to monetize that attention through advertising. He traces the development of such merchants back to the 1830s and the first adverts appearing in newspapers, which quickly became an important income stream. With the invention of every new media he documents how advertisers found ways to colonize it – magazine ads, sponsoring radio and TV shows, commercial breaks, product placements, celebrity endorsements, ads on websites, etc. – along with other spaces such as posters on streetscapes. He makes the case that we are now constantly bombarded with advertisements and media tricks (e.g., clickbait) designed to nudge us towards consumption. This forced diet of ads has not been accepted without resistance, however, with consumers fighting back in various ways such as switching channels and using ad blockers. 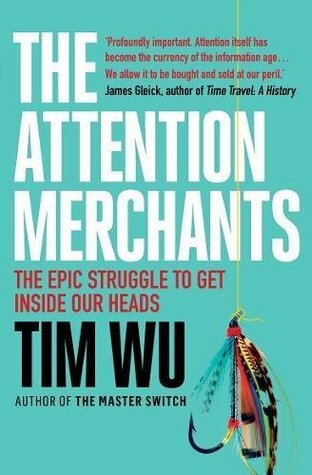 As with The Master Switch – Wu’s history of information industries – the book provides a fairly long history of the relationship of media and advertising through a series of short, accessible chapters full of interesting stories and facts. It’s wide-ranging in coverage discussing a broad sweep of attention merchants and their work, though it’s very US-centric despite a couple of brief forays to the France, UK, Nazi Germany, Canada and Japan. While no doubt the US has led the way in driving the attention merchants business model, media and advertising has been pushed forward elsewhere and also taken different forms and been resisted in varying ways. While up-to-date, including Trump’s use and pursuit of attention, I was somewhat surprised that the present role of data extraction and data brokers in profiling consumers is barely discussed. Overall, an engaging, informative read.